Family friendly and newly renovated hotel with free parking. Situated 4 km from the city centre and just a 10 minute drive from the arena. Our hotel has a restaurant and we offer a free use of gym, sauna and indoor pool. We also have free Wi-Fi. The above prices are per room and night, and includes our big breakfast buffe. To make a reservation please e-mail us at norrkopingnord@scandichotels.com or call us at +46 11 495 5510. Mention booking code “Stadium Basketball Cup 2019". Recently renovated rooms close to the city centre and only 300 m from the railway station. Walking distance to Norrköping sights and shopping. We can offer parking in our garage or outside in our courtyard for a small fee. 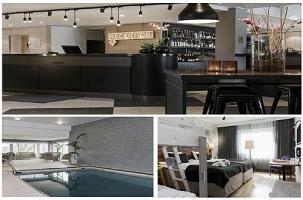 The hotel has a restaurant and a, free to use, relax with sauna, gym and an outdoor jacuzzi. We also have free Wi-Fi. The above prices are per room and night and includes our big breakfast buffe. To make a reservation please e-mail us at norrkopingcity@scandichotels.com or call us at +46 11 495 5210. Mention booking code “Stadium Basketball Cup 2019”.